Pour water into a small saucepan. Sprinkle with the gelatin and allow to soak for a minute or two. Heat over very low heat, stirring constantly, until gelatin is dissolved (about 5 minutes). Stir in sweetened condensed milk. Remove from heat. Add the vodka, liqueur and schnapps, stirring well to incorporate. Pour into pan and refrigerate until fully set, several hours or overnight. To serve, cut into 1 inch squares. Immediately before serving, garnish with crushed peppermint candies, if desired. After a day of shopping, gift-wrapping or general hustle and bustle around town, a festive cocktail is just what I need. One of my favorites is a Candy Cane Martini, a vodka-based cocktail featuring peppermint schnapps, and rich, delicious white chocolate liqueur. The jelly shot interpretation of the cocktail stays close to its inspiration. In addition to the above liquors, I added a dairy base (a little sweetened condensed milk) to give the jelly shot a creamy texture and balance (i.e. tone down the booze factor a notch . . .). Peppermint schnapps is an ingredient that should be used sparingly – just a small amount is used in the recipe, yet mint is clearly the dominant flavor profile! This minty-ness is tempered by the white chocolate liqueur, which rounds out the jelly shot and adds depth of flavor. If you don’t have white chocolate liqueur on hand, white crème de cacao can also be used. 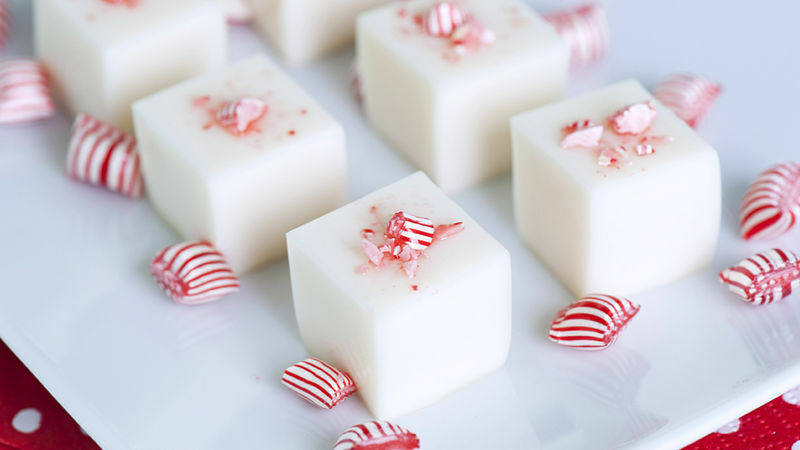 For serving, garnish with crushed peppermint candies. For best results, be sure to add at the very last moment before serving, as contact with the gelatin can melt the candies over a long period. Or serve Candy Cane Martini Jelly Shots sans garnish on a pretty holiday-patterned plate! Hope you are enjoying the holidays!